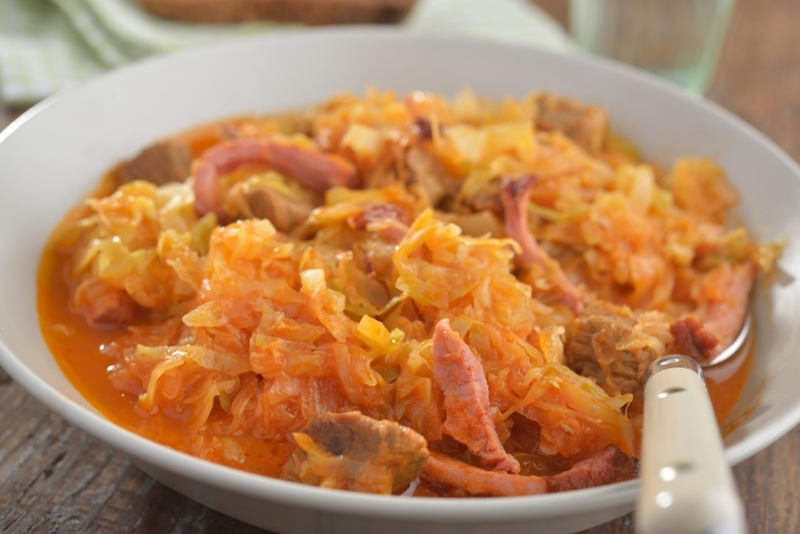 Known as Bigos, this traditional Polish dish is mouth-wateringly tart and will quickly become one of those meals you crave on a regular basis. This stew has been appropriately described as Poland’s chili, because the variations from home to home are endless. Sometimes the pork is replaced with beef or venison, and apples or even prunes are added to the mix. So, feel free to use this delicious recipe all on its own or as a base for getting creative! Although extremely simple to prepare, it can sometimes take a while for the flavor to really develop, so if you know you’ll be running short on time, you can easily make this as far ahead as you like! It keeps very well in the fridge or freezer. You won’t be sorry you tried this, we promise! This might become your new favorite dish! In a large pot, on medium-high heat, boil cabbage and sauerkraut in about 2 cups of water for 10-15 minutes, until tender. Remove from heat and set aside. Heat olive oil in a large skillet over medium-high heat and sauté pork for 6-8 minutes. Add sausage, onion and garlic and cook until sausage is lightly browned. Add sauerkraut mixture (including sour water from the pot), vinegar, bay leaf, tomato paste and sausage mixture to the skillet. Bring to a gentle simmer and let cook, uncovered, for 45-90 minutes, until desired thickness is reached.